I didn't do a good job frying them, looks a little uneven browning. (-_-") I suspect it's because I left the meat rolls in the fridge before frying them...made the skin a little soft. 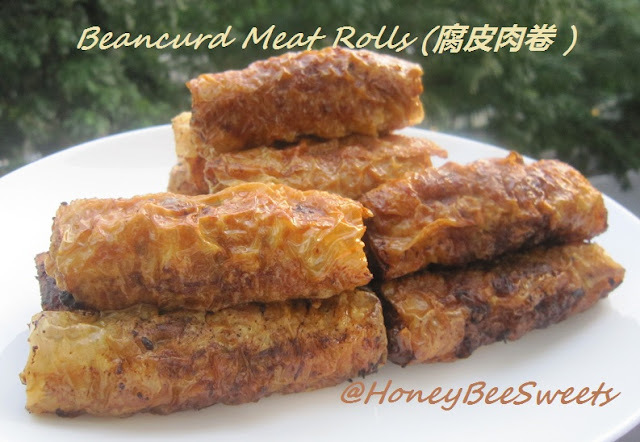 Or maybe it's the brand or type of beancurd skin? Anyway, just make sure you have ample time to wrap and fry them at one go. In a large mixing bow, add in all of the ingredients up to cornflour and mix it well. On a counter top, open up the beancurd sheet and moisten it slightly the corner you are using with a clean damp towel a little. Scoop about 1 heaping tablespoon worth of filling onto a corner of the moisten beancurd sheet. Then cut out the sheet enough for you to wrap one roll. Fold in the sides and roll it up like a swiss roll and brush the ends with egg wash to seal it. Have ready a frying pan heated up with some oil and fry the meat rolls until golden crispy. Scoop up and drain on paper towels. Serve while still hot or over a bed of sauted greens. Next up is desert, a simple cake that my kids love; Banana Cake with Oreo chunks. 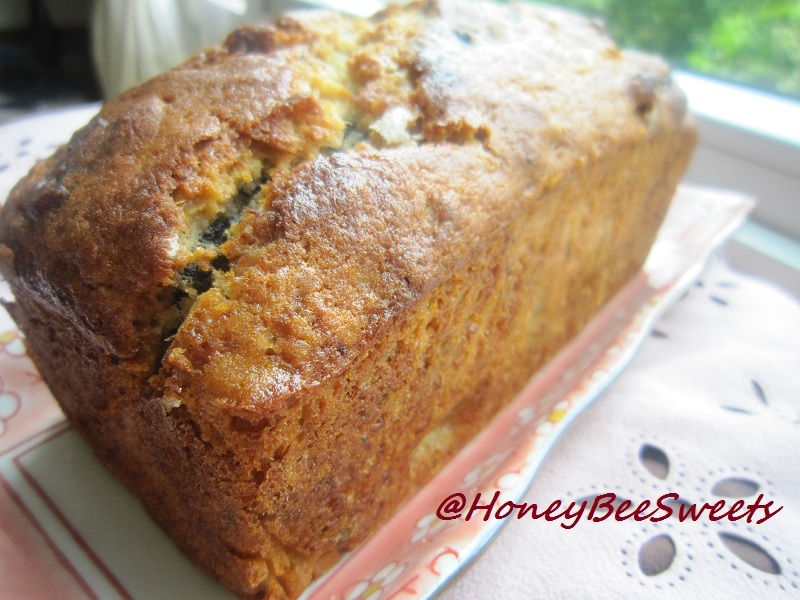 I probably have posted close to a dozen banana cake recipes in my blog now, but it always seems like a popular and easy to reach ingredient to use, don't you agree? It not only moisten but also added extra flavor and texture. And with Oreo added, what's not to love? This recipe has been adapted from the recipe in Florence's blog; Do What I Like. When I served the last slice to my younger daughter, she said "Make again tomorrow Mama!" Lol! I said "Don't you want to try other cakes? ", her reply was simple "No". ^_^"
1. In a large mixing bowl, add in all the ingredients for Set A and mix well. 2. In another separate bowl, mix all the ingredients for Set B and mix well. 3. Pour (A) into (B) and mix everything with minimum handling. 4. Spoon batter into muffin tray lined with paper muffin cups up to 80% full. 5. 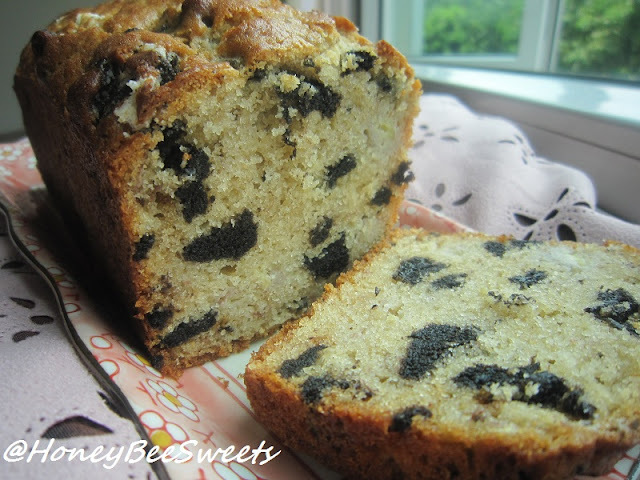 Top with sliced banana and oreo pieces if desired. 6. Bake at 180C for 20 minutes for muffins and 30 minutes for loaf pan. If tester comes out clean, it's done. The crumbs are fine and the cake is light, not dense. Remember not to overmix the batter. :) Feel free to subsitute the Oreo with Chocolate chips, but I doubt it'll be the same. :P Try it out and you will see what I mean. Happy baking!! Okay all, have a great week ahead! Cheers! My kids love tarts, especially my elder daughter. Whenever we are at bakery stores (yes, I still buy bread and pastry even though I bake so often), she would choose tarts over bread or buns. So that is why I am always on the look out for good delicious tarts that are not too hard to whip up. Just over the weekend, I had some free time (thanks to my husband) and found a good one from Carol's site. 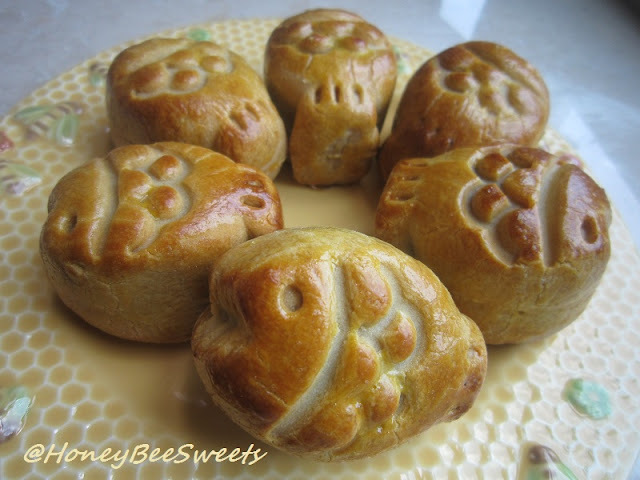 It's call 德式乳酪布丁塔, loosely translate as German style Cheese Pudding Tarts. 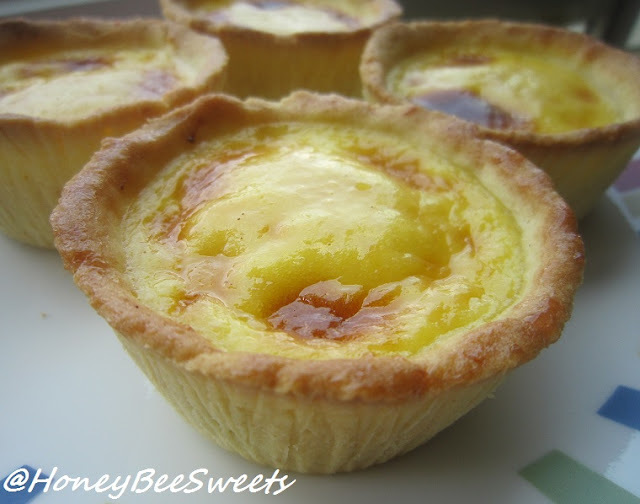 These tarts have this distinct char look on the top of the cheese custard surface. However I am no fan of charred food, so I try to minimize the charring, lol! I will post my version of the recipe since I did make some modifications to it. But if you are interested in the original recipe and need to see more detail pictorial steps, pls refer back to Carol's site. In a large mixing bowl. sift the cake flour and confectioner's sugar in. Add in the Parmesan Cheese and salt and mix in. Then knead in the cold cubed butter pieces using your fingertips until it resembles breadcrumbs. Lastly add in the egg yolk and knead till everything comes together to form a soft pliable dough. Wrap in plastic and chill for 30mins before use. In the meantime, grease and dust with cake flour the tart shells and set aside. After 30 minutes, remove the chilled dough and divide it equally into 5 portions (4 if bigger tarts). Then press the dough portions into the prepared tart shells. Then chill in fridge until needed. In a heat proof sauce pot, add in the milk, sugar and tear in the cheddar cheese. Place over medium low heat and stir constantly till the cheese and sugar melts and well combined. Remove from heat. In another bowl, beat the egg and egg yolk together and add in vanilla extract and the heavy cream and stir well. Slowly add the egg mixture into the warm milk mixture and mix well till well combined. 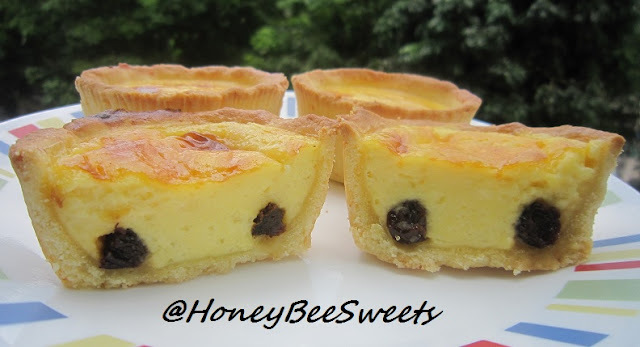 In the pastry tarts, place about 4 to 5 raisins at the base. Then distribute the custard filling equally among the 4 or 5 tart shells to about 85 to 90%. Bake the tarts in the preheated oven for 30 to 40 minutes till the top is browned and doesn't wobble when shaken. Remove from oven and let cool completely before unmolding. You can glaze the surface with some warm fruit jam. The pastry is buttery and cheesy, I love it! 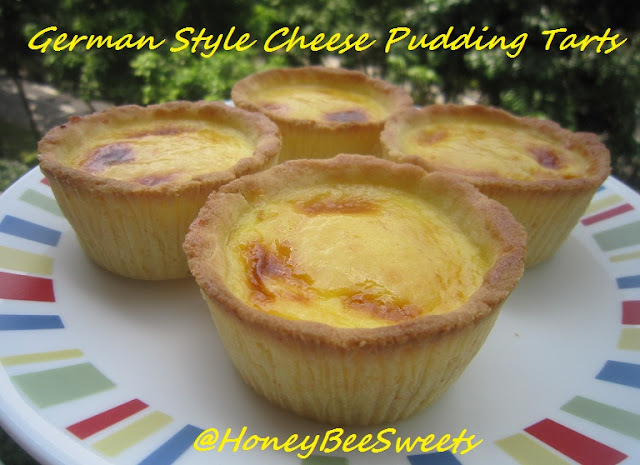 The custard filling is sweet, savory and cheesy cream texture, yum yum! The raisins inside is like a sweet bonus. I will definitely make this again, and double the recipe. :)) Do try this out if you like cheese and tarts, its highly recommended! Have a good weekend all! Cheers! For the chocolate sponge cake inside, I have adapted a new method call "烫面方式" (cooking the batter). 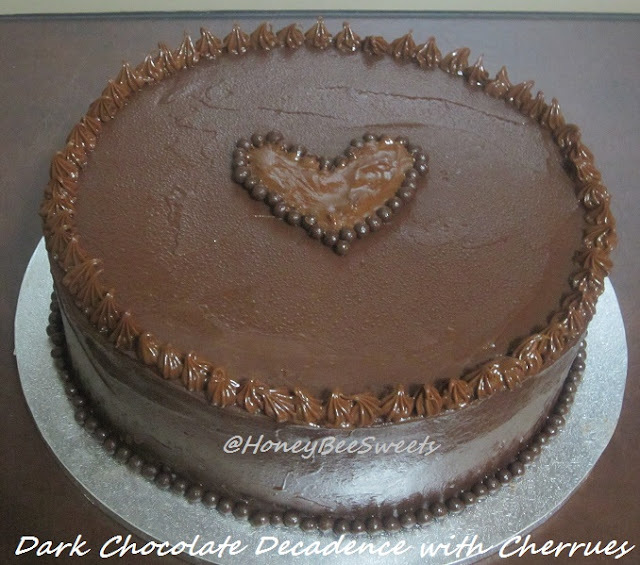 I wasn't sure did I went wrong somewhere but the cake I baked didn't meet the high expectations I heard about and anticipated. Nevertheless, it was still acceptable and I just used it anyways since I don't have the lesiure to bake another one! Cook Set A ingredients in a heat proof sauce pot over medium low fire. Have a thermometer to make sure the temperature reaches 65C. Once it reaches 65C, add in the sifted cake flour and cocoa powder. Stir and mix well till the mixture is thick. Mix the ingredients in C in another mixing bowl and gradually add it into the flour mixture. Once incorporated, set aside for later use. Using the beater, whip the whites till foamy and gradually add in the sugar and beat till the mixture is stiff peaks and shiny. Preheat the oven to 170C. Get ready an 8" X 3" round cake pan with removable base. In 3 separate portions, add the whites to the egg yolk batter till everything is incorporated in. Pour the cake batter into the pan and bake till the cake top is formed, about 20 minutes, then reduce the temperature to 160C and continue to bake for another ~25 minutes till the cake tester comes out clean. Once done, remove from oven and invert on a rack to cool completely before removing from pan. For the chocolate cream and ganache my previous recipes, thanks. Hope you all have a great week ahead all! Call it anyway you like it, yam or taro, this root vegetable is one delicious ingredient that I love adding into my cooking. In fact I regularly steam up some yam kueh every month for my family since they liked it a lot. However, today I'm posting 2 other yam recipes; Sweet Yam Bread Loaf and Flaky Spiral Yam Mooncakes (芋头酥饼). Although I do still need to brush up on my shaping technique ^_^", overall I am still very happy with this recipe. 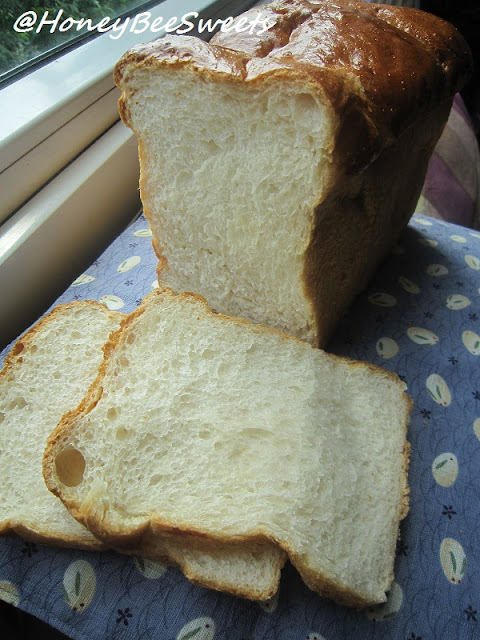 The bread turned out really soft and bouncy, and no long hours of waiting for the pre fermented dough! Sweet isn't it?! I experimented a couple times, first with purple sweet potato, and then with yam. Both gave very good results. 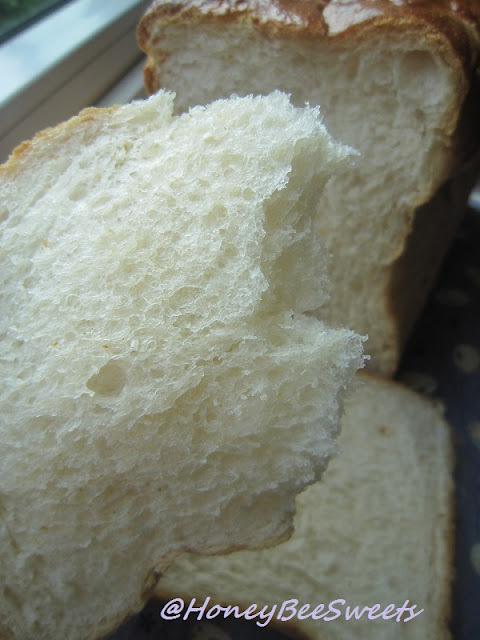 I guess you can't really go wrong using root vegetables in bread baking, it usually yield very soft bread. In a mixing bowl, mix everything together and knead till it becomes a soft pliable dough. Place the dough into a small zip-lock bag and chill in the fridge up to 4-6hrs. 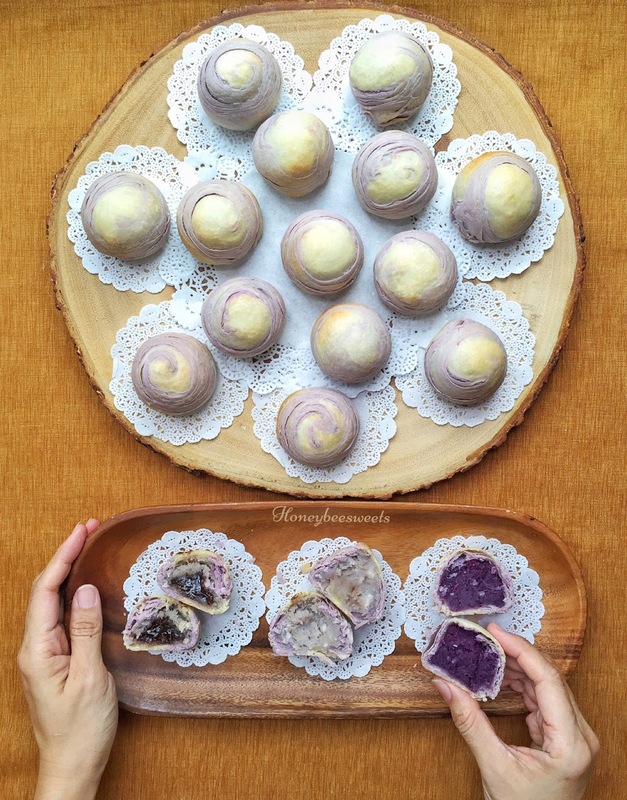 Since yam (taro) itself has not much of a color, it's no surprise that bread baked with it will turned out looking like plain old white loaf. 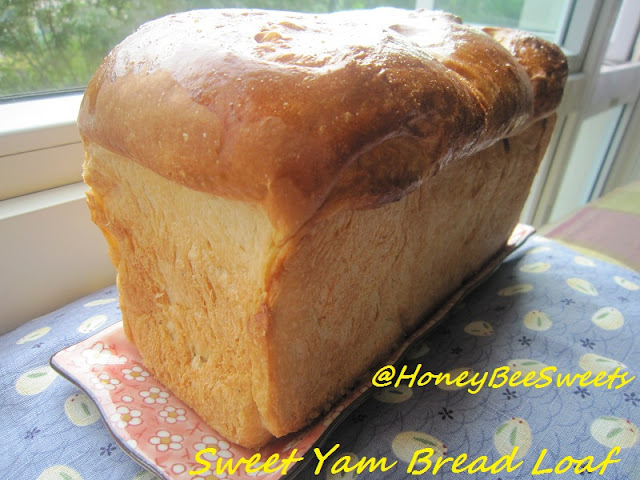 But there is a slight evidence of yam fragrance in the bread, nice! Although I did think about adding mashed sweetened yam as a filling, but later put it off the idea as I worry it will weigh down the whole loaf and hinder the rising of the dough. Next up, I like to post up the Flaky Spiral Yam Mooncakes that I baked a week back. Somehow I fear that if I don't post this up sooner, it'll go out of "fashion" since Mid-Autumn festival is already way over! 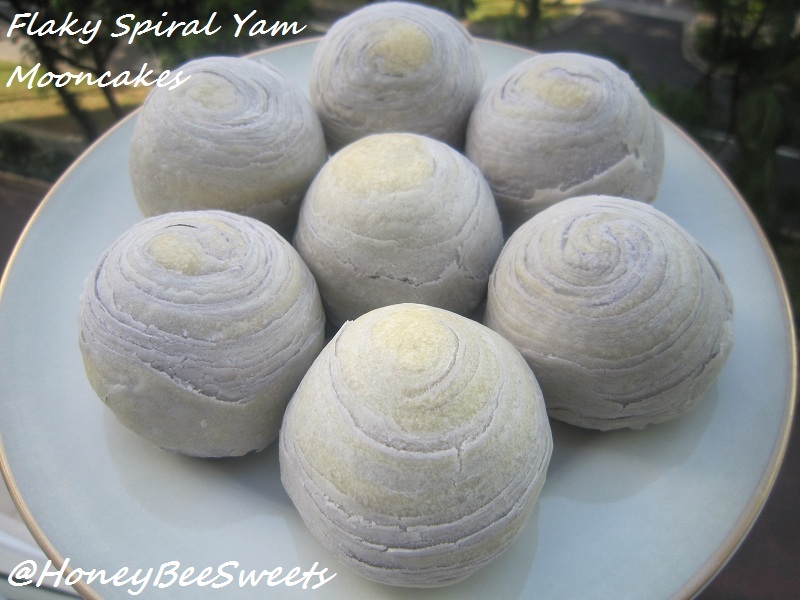 You folks must be going "another spiral yam mooncake?!" Hahaha, I know, this is such a popular recipe among the bloggers this year! All thanks to Carol for sharing this wonderful, yes, super wonderful recipe for us to try. 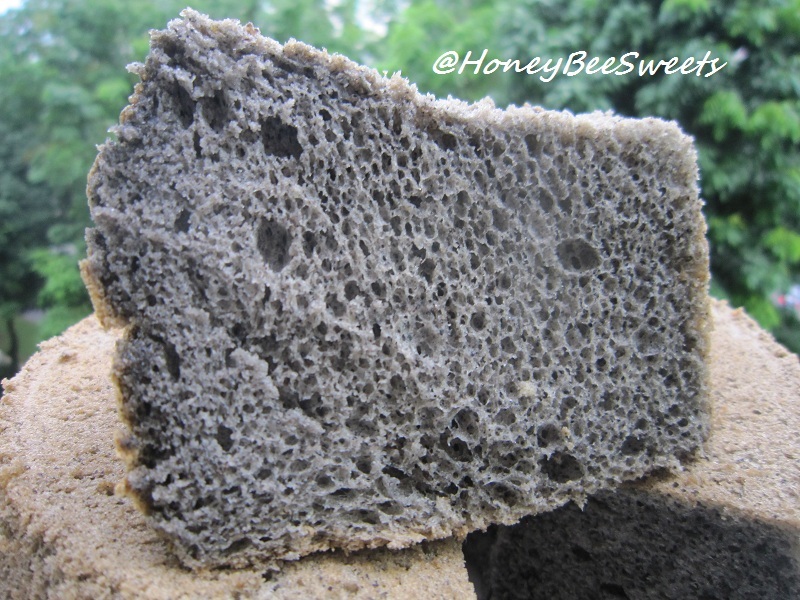 Steam the yam chunks at high heat till soft. While still hot, mash the yam till creamy. Then quickly add in the sugar, milk powder and butter and mix till well combined. Let cool and chill in the fridge till needed. Mix everything together and knead till it comes together into a pliable soft dough. Cover and let rest for 20 minutes. 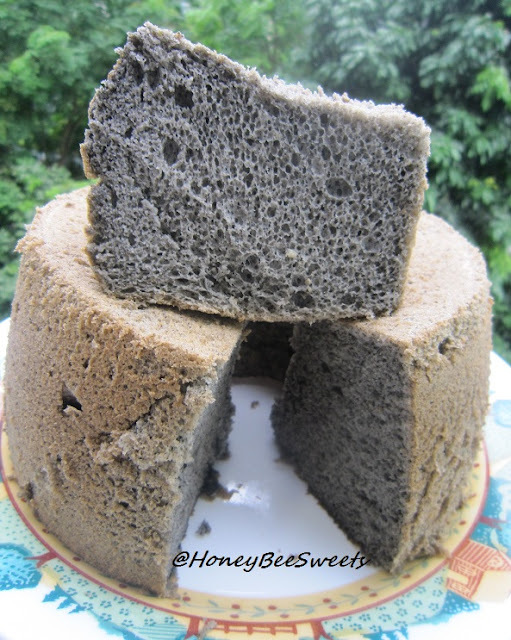 Mix cake flour, essence and ghee together till it's soft and pliable. Then add the food coloring and knead till the color is uniform. Cover and let rest 20 minutes or chill in fridge till needed. Divide the water and oil dough into 10 equal portions and roll round. Cover the dough when not using to prevent from drying. Also weigh out 20 portions of 40 g yam fillings. Do check out my post on Purple Sweet potato Mooncakes for the steps in making them. Needless to say, I'll be submitting this to this month's Aspiring Bakers #11; "Mid-Autumn Treats!" hosted by Happy Home Baker. 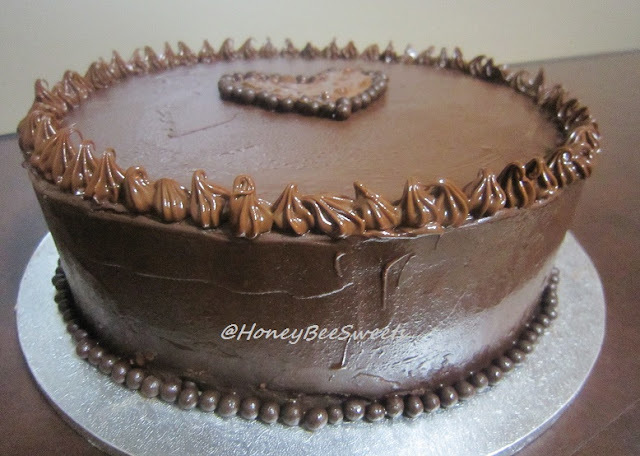 Update (26th Sept 2015): I baked this recipe again and decided to use Purple Sweet potato filling and Yam with chocolate truffle filling as well. After you have divide both the oil and water dough portions, take one of each. Flatten the water dough and place the oil dough in it. Wrap the water dough around the oil dough and seal up nicely. Use your palm and gently flatten it. The using a rolling pin and roll it out into a long oval shape, making sure you don't rip the dough. Then gently roll up from one end to a swiss roll form. Repeat for the rest of the dough portions. 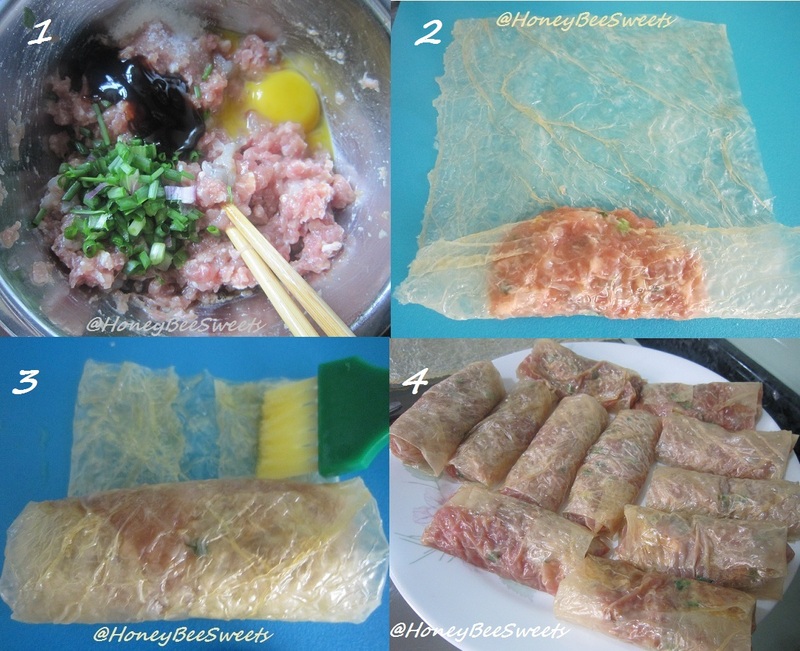 Placing oil dough in water, seal, roll to oval shape and roll it to swiss roll form. Do till all the doughs are used up. You then again roll up from one end like a swiss roll. And repeat for all the dough portions. Take one of the swiss roll and cut it into two equal portions. You will repeat and then have 20 of these halved swiss rolled dough portions. Now you flatten the halved dough and placed the rolled round filling in the center and seal it up nicely. If you are adventurous like me, you can even add chocolate truffles into the yam filling. 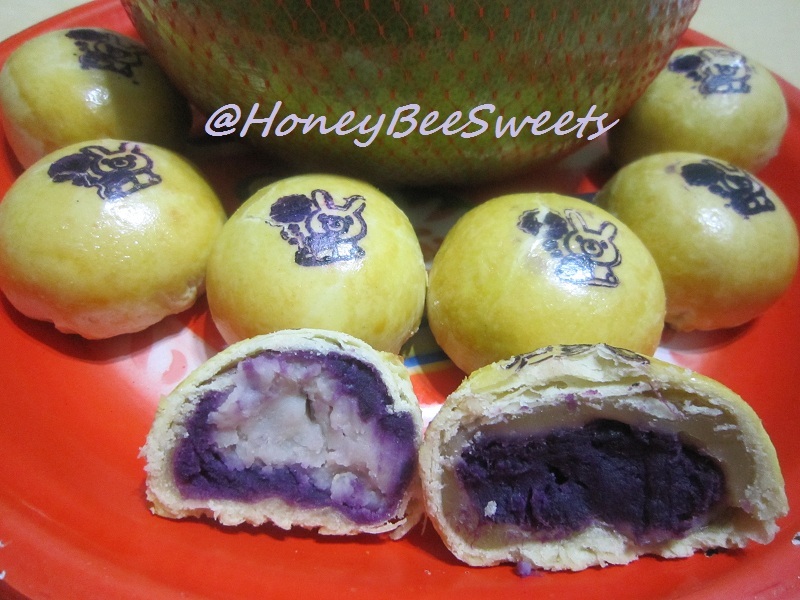 Else try Purple Sweet potato paste, also peel 200 g , steam, mashed with 40 g butter, 30 g powdered sugar and mash till creamy thick. Bake in the preheated oven of 165C for 26-28 minutes. Once baked, remove from oven and let cool over rack and enjoy while still warm. The pastry skin will be best on the day it is baked. Else re-toast in the oven at 150C for 10 minutes. I actually love the filling a little chunky to give it that homey rusty taste. 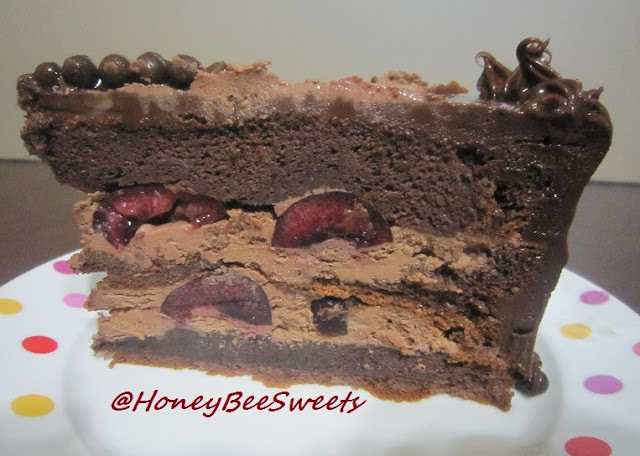 :) And that new chocolate truffle with yam paste turned out surprisingly yummy. 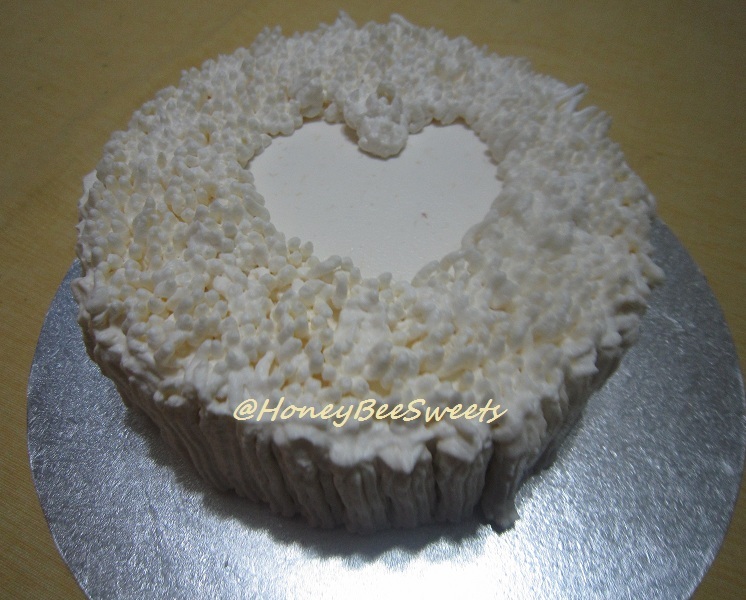 :9 The older folks actually love the yam and sweet potato filling the best since it is not overly sweet. Do try this out and let me know how you like it! While the mashed sweet potato is still warm from the steaming, add in the butter and sugar in. Mix till all incorporated. Set aside to cool before use. Mix everything together till it comes together to form a soft dough. Divide into 8 or 10 equal portions, cover and let rest till needed. Wrap each oil dough portion inside a water dough portion and seal nicely. Repeat till all has been wrapped in. Then roll each round into a long flat oval. Roll it up like a swiss roll and again repeat for the rest of the doughs. Then roll each swiss roll into a long flat oval and again roll it up like a swiss roll. Repeat for all and set aside. Preheat oven to 175C and line a baking tray with parchment paper. Weigh out 8 or 10 portions of 40g of sweet potato filling. Then taking a swiss rolled dough and roll it out into a round and wrap with a sweet potato filling in it, making sure it seals up nicely. Repeat till all is wrapped up. 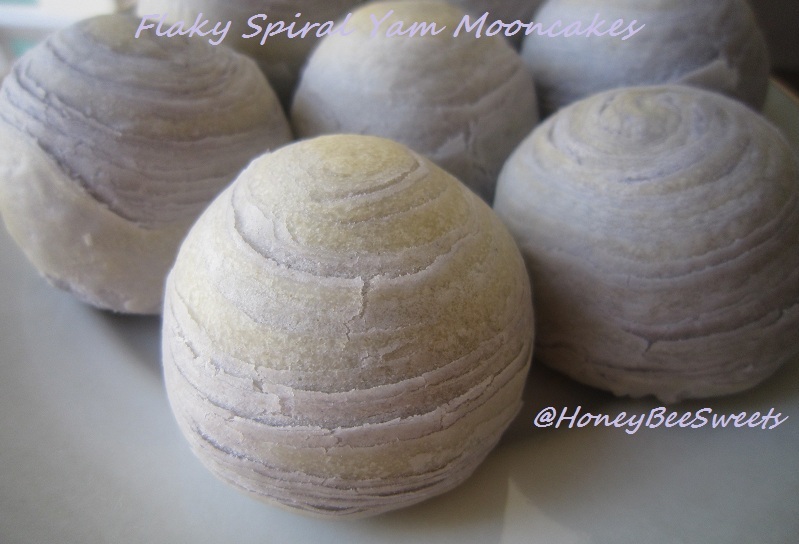 Brush all the mooncakes with egg wash and bake in the oven for 20 minutes till the mooncakes are golden brown. Once out of the oven, you can again give it another egg wash coat to make it more shiny. Let cool completely then store in air tight containers or freeze them up to a month. Just thaw to room temperature when want to consume. 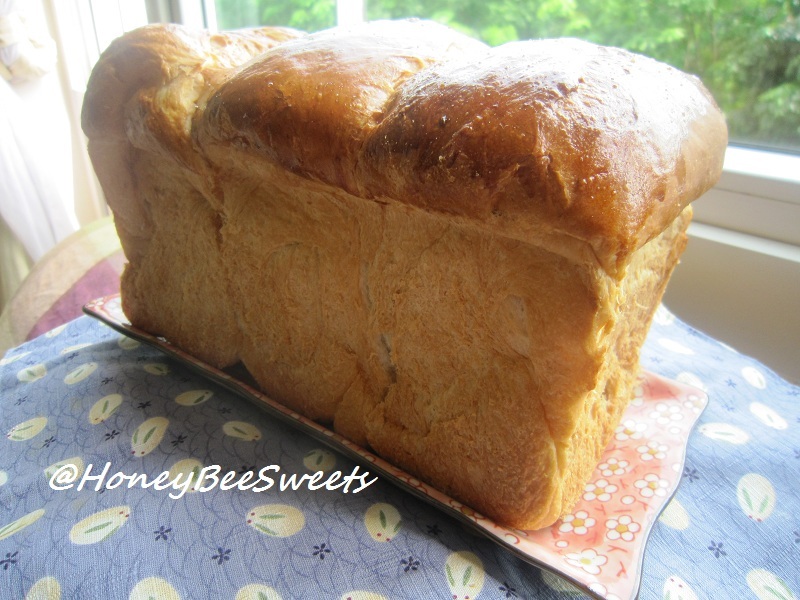 I just love the flaky light & buttery outer crust with the soft creamy sweet potato filling inside. I ate one up once it cooled down with a nice cup of hot tea, heehee. :D I even added an addition layer of sweetened mashed yam / lotus paste to go with the purple sweet potato to give it more texture and flavor. The cakes were not overly sweet or heavy at all, just the perfect desert to enjoy right after dinner tonight. 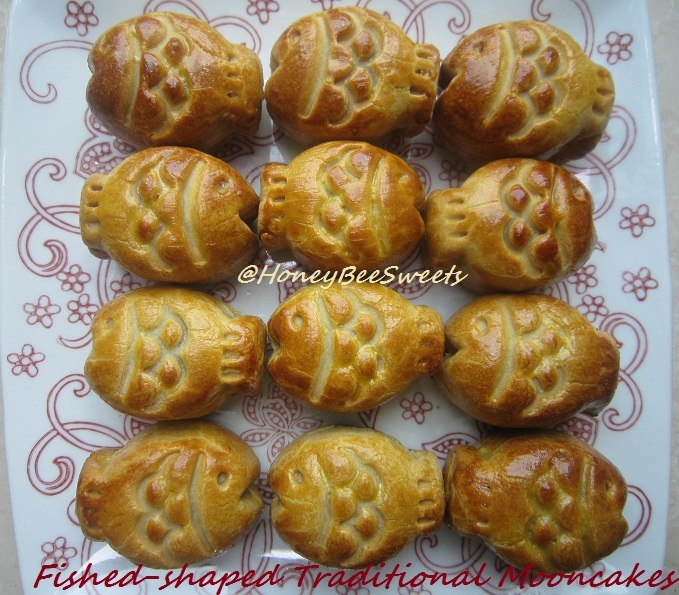 :) In fact, this delicious cakes should be made even if its not mid autumn, it's good anytime! 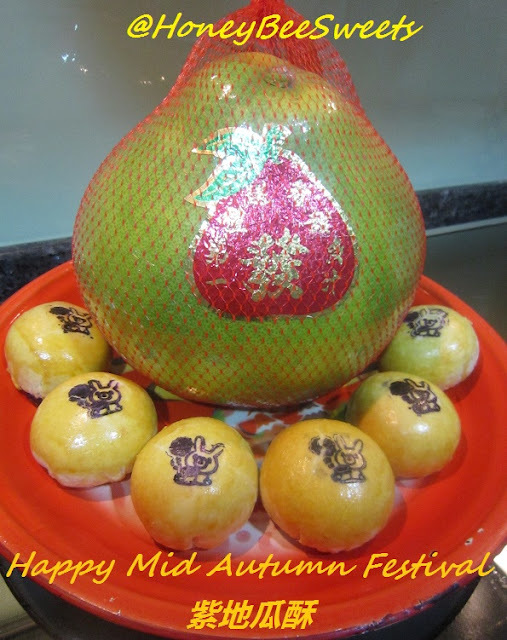 I am submitting this post to this month's Aspiring Baker's #11 "Mid-Autumn Treats!" hosted by Happy Home Bakers. Will sign off here, and will try to post up another mid autumn treat soon. Have a good one all! Measure out the golden syrup, alkaline water and vegetable oil in a small bowl and mix well. 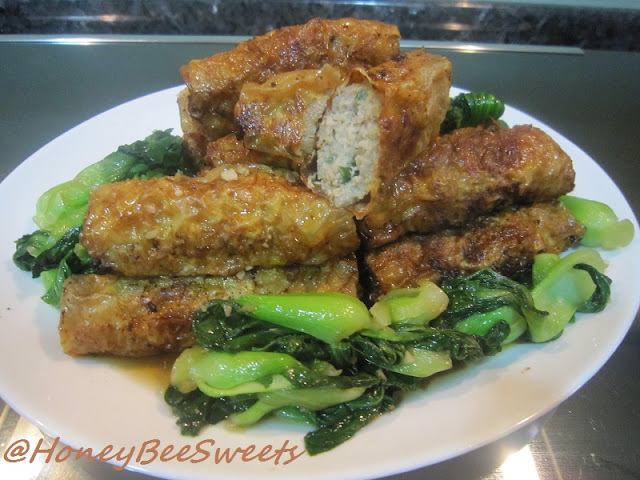 In a large bowl, add sifted Hong Kong flour, make a well and add in the golden syrup mixture. Stir well and gradually will form a soft pliable dough. Cover and let rest for 20 mins. Lightly dust some Hong Kong flour on table. Then divide the dough equally into 12 portions of 34g. 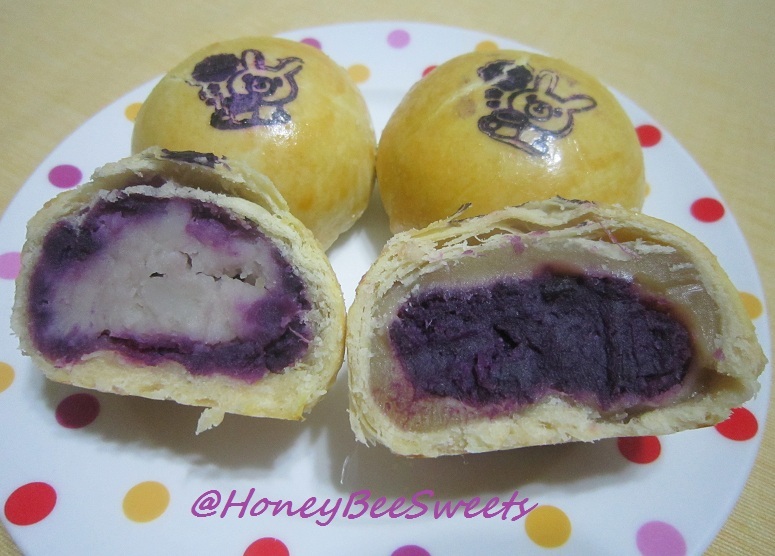 Also measure out six 36g of red bean paste portion and six 36g of lotus paste filling. 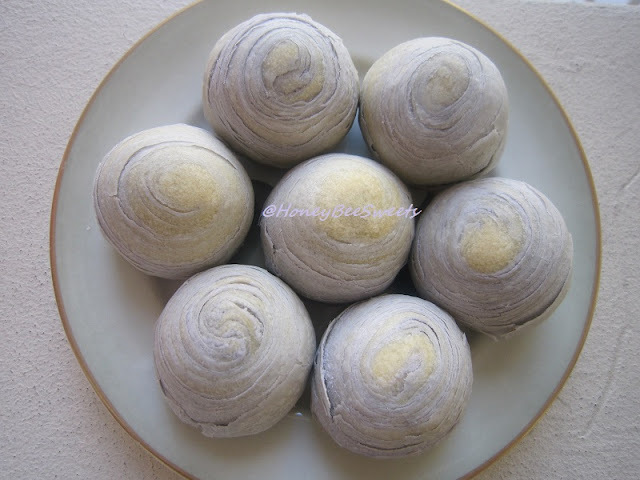 Wrap each filling portion inside a dough portion and lightly dust the ball with some flour and place it into the mold. Gently and carefully press the mold to form the desired shape. To dislodge the mooncake, gently push out the unbaked mooncake on the lined baking tray. 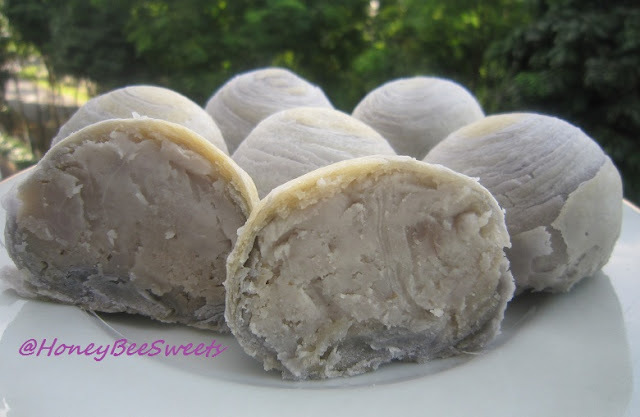 Baked in preheated oven 180C for 5 mins and rest to cool down (about 10 mins) before egg wash mooncake with a soft brush and bake for another 10 mins at 175C. 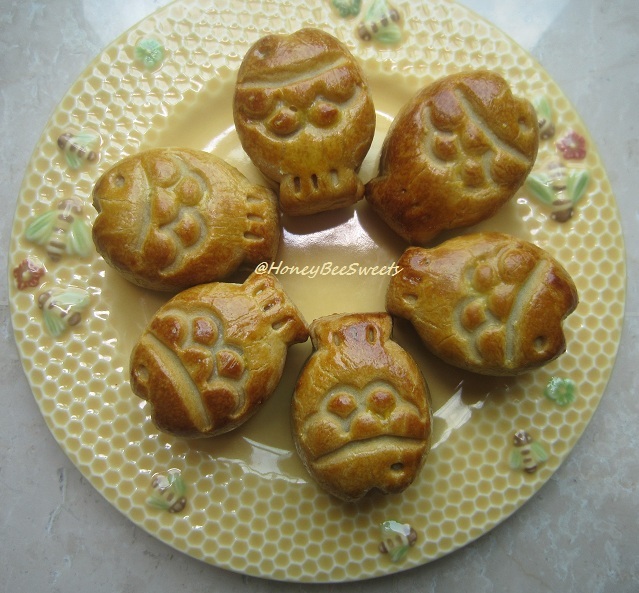 I will be submitting this to this month's Aspiring Baker's #11 "Mid-Autumn Treats!" hosted by Happy Home Bakers. Thanks for hosting HHB! Okay folks, its getting late, signing off now. Cheers! 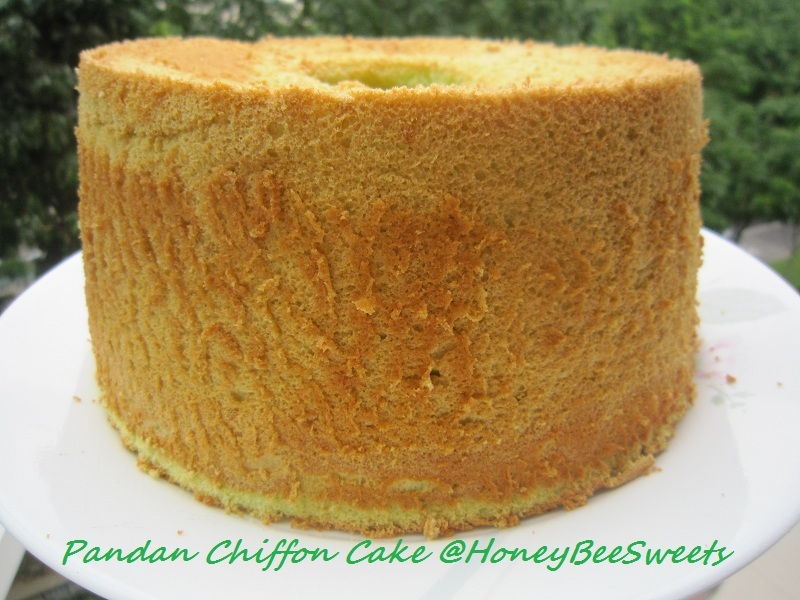 Today will be posting 2 chiffon recipes which I find them pretty yummy. 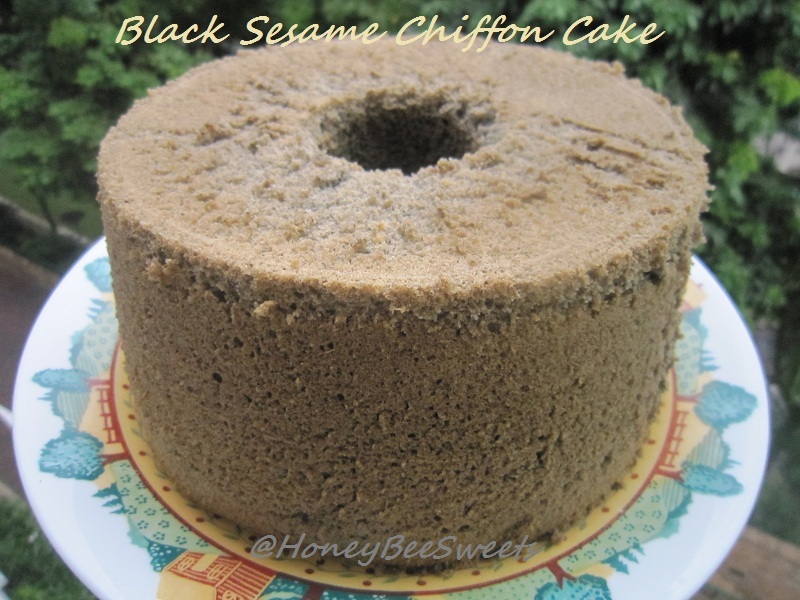 :) First up is Black Sesame Paste Chiffon Cake. Notice I said "paste" because I didn't use black sesame powder for this recipe, simple as that. My family has been helping me get black sesame paste from Taiwan since its quite $$$ here in Singapore. Add in black sesame paste, coconut milk and vegetable oil and mix well till combined. Then sift in the cake flour and baking powder into the yolk mixture and stir well till no visible flour. For egg white batter: In a large mixing bowl, beat the whites and cream of tartar at high speed till foamy. Gradually& slowly add in the caster sugar while its beating. Once the whites reaches stiff peaks, reduce the speed to lowest and let it stir for another 20 sec before switching it off. This step will help stabilize the bubbles. In 3 separate portions, fold the whites into the yolk batter. Then pour the batter into the tube pan and bake for 28 to 30 minutes or till the tester comes out clean. Once you remove the tube pan from the oven, immediately invert it to let it cool completely before removing the cake out from the pan. 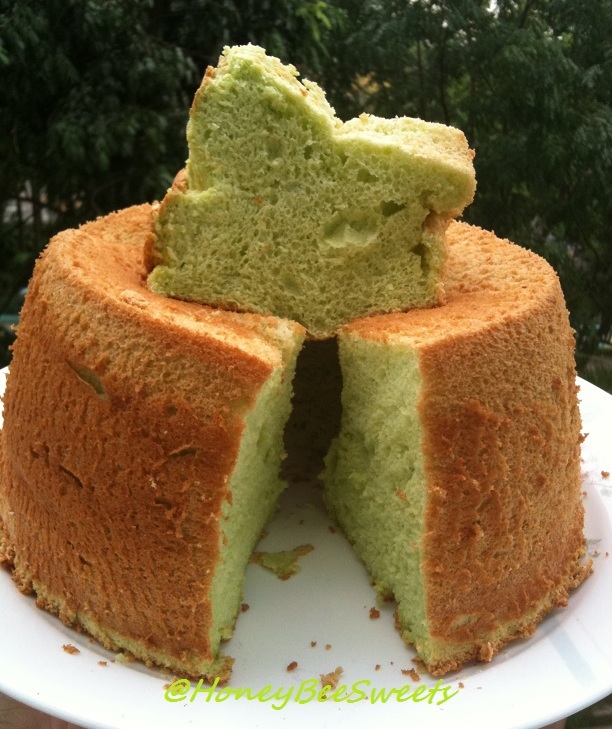 With the balance of the coconut milk, I decided to bake a Pandan chiffon. This recipe which I came up with was pretty good and I thought why not just post it up to share. Note: Blend the pandan strips together with the coconut milk and milk. Got this tip from Gertrude of Kitchen Snippets. Then sieve the greenish mixture through a fine sieve. Yes, NO pandan extract is needed. The method will be similar to the steps above. 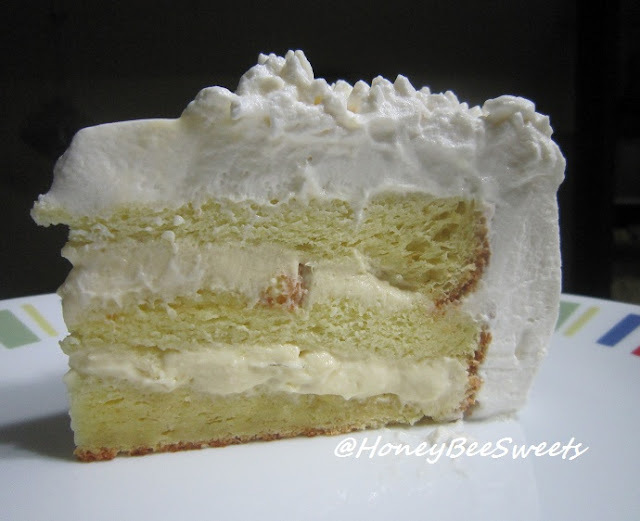 This recipe uses more egg whites and I reduced 1/3 of the coconut milk to using fresh milk. It is still very fragrant but i know it's a much healthier version. Got to go folks, hope you have a nice weekend and school holiday break!